Isn’t it funny how our fears change over time? I heard about one fellow who remembered how he used to be afraid of the dark when he was a little boy. Now that he is an adult, he is no longer afraid of the dark, but he is terrified of the electric bill! No matter what stage we are going through in life, it seems that there is always something that frightens us. To be certain, there are things which should concern us—health problems, family conflicts, financial struggles, cultural issues, etc. However, the Bible continually urges us not to be afraid. God doesn’t want his children living in a constant state of fear. The opposite of fear is faith. Let us remember to turn our fears over to the Lord, prayerfully believing that he will see us through any circumstance in life that comes our way. 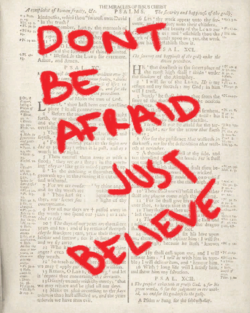 “…Jesus told him, ‘Don’t be afraid; just believe.’”—Mark 5:36.